blog.HalloweenAdventure.com | Latest News from the Costumes Trend FrontLines! : Wiggin' Out! This Halloween season; deck yourself in decadence with our wide selection of wigs. Wigs are one of the easiest ways to add a little pizzazz to your costume. Sometimes, they can even be a costume in and of themselves! Our wig selection is sure to dazzle with everything from 80s rocker chick to Marie Antoinette. Read below for ideas on how to rock a wig everywhere from the supermarket to the office. Feeling fancy? 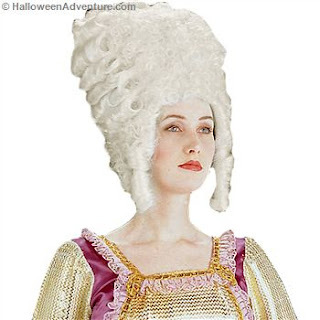 Our Marie Antoinette Wig makes you feel as though you’re born royalty. With a large pile of curls in perfect formation, this wig makes a statement with or without a costume. This look is made with a stretch fit cap, and is washable, so if anything goes down with the prince and you just “happen” to get lipstick in your curls, you can wash your sins away! Play the part of Maid Marion in our Medieval Blonde Adult Wig. This wig is impossibly long and blonde with a skin tone part and gorgeous side braid. It’s made for maidens and princesses. Play it up with a medieval dress, or make like Rapunzel and put it all in one long braid. Do you love Lucy? I sure do! 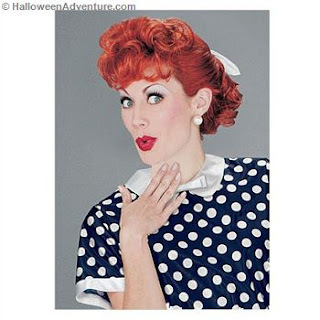 Our I Love Lucy Wig is the perfect imitation of Lucy’s trademark red coif. The bright red sheen of this wig guarantees you won’t go unnoticed. We recommend changing it up and wearing this one to work on Halloween day. You’ll have people seeing double! Feeling groovy? Snag our 60’s Pop Icon Wig and make like Twiggy way back when. This short, layered blonde style fits perfectly over and style of hair and turns the modern day diva into a retro chic beauty. Wear it with your favorite sixties style dress and load up on the mascara and eyeliner! Good to go, groovy girl! 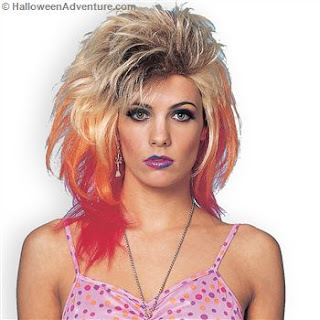 Do an ode to your rockin’ childhood with our 80’s Multicolored Shag Wag. A blonde do streaked to perfection with red and orange, and layered just like the good old days, this wig will have you whipping out your air guitar on the subway. Addicted to love? Maybe. Addicted to 80s? Definitely. Whatever wig you choose; make sure you pair it with a whole lot of personality. Hair today, new hair tomorrow!